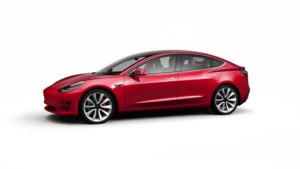 From February 2019 two Tesla Model 3 will belong to the dim car pool. A Model 3 „Performance“ with 487 hp and a Model 3 „Long range“ with 346 hp will be available. Please, send your request to: contact@drive-in-motion.com. The new promotional brochure 2019 is ready for download! Since 03.12.2018, the new drive in motion promotional brochure “Automotive Events 2019” ist available in German and English. 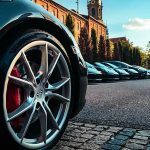 The new brochure contains two new sports car and Tesla tours starting from Hamburg or Berlin, heading for Rügen. 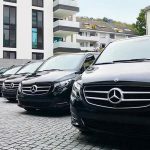 By these offers dim satisfies the increasing demand for automotive experience trips through the northern part of Germany. These two new packages expand drive in motion’s range of interesting offers all over Germany. 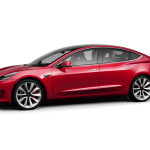 Starting in March 2019, the new Tesla Model 3 will be available for renting and for automotive events. The end of season of our driver trainings in own or rented sports cars on Boxberg, Hockenheimring as well as on Lausitz- and Sachsenring will be in October, at Bilster Berg in the beginning of Noverber! 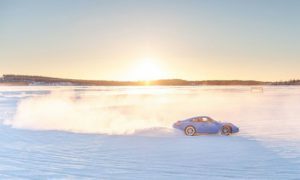 The dates for Porsche winter trainings in Lapland and at Katschberg/Austria in 2019 are set and will be announced shortly. For requests, please send us an eMail contact@drive-in-motion.com! 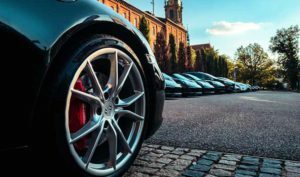 From now on several programs and offers concerning luxury sports cars, enjoyment and lifestyle will be developed in cooperation with ROOMERS Baden-Baden. 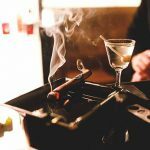 With CARS – CULINARIC – CIGARS the first cornerstone was founded. You can find this exclusive programm on our website as well as on the Website of ROOMERS Baden-Baden. 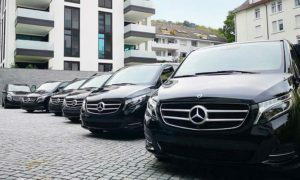 Dim was asked to provide 8 Mercedes-Benz V-Classesfor a “James Bond Chase”, starting at ROOMERS Baden-Baden. The cars were on the road with their teams during the hole day to find game sections ans solve quest at the Black Forest. 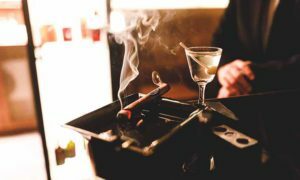 In the evening about 110 guests were driven to a restaurant at Baden-Baden. 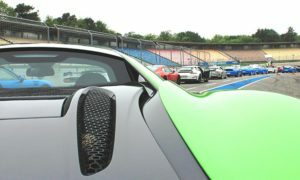 A pleasant development showed requests and sports car bookings this year by individual guests from all over the world. 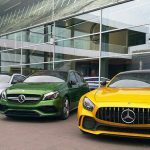 The number of requests for sports cars and self drive tours from Concierges, travel agents and hotels increased in 2018 onwards. 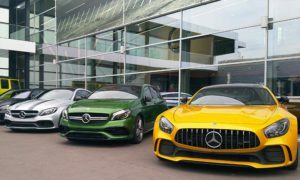 From now on nearly all Mercedes-AMG models (43, 45, 63 and 65) are available at drive in motion. In July 2018 a sports car driver training with customers from Germany and Switzerland took place at the Hockenheimring. 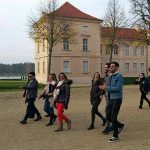 Dim was booked by VisitBerlin and Cultour Incoming, to introduce 13 brazilian luxury travel agents to the Berlin e-drive Experience. 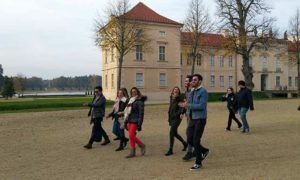 These agents from brazilian luxury travel agencies had the occasion to experience the fabulous speed-up of a Tesla Model S and X plus a trip into the surrounding of Berlin. 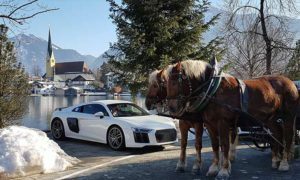 In January dim was ased to organize a Audi R8 winter driving experience. 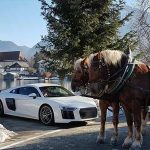 Six Audi R8 V10 plus and one Audi RS 6 Avant were driven at the foothills of the Alps to Althoff Seehotel Überfahrt at the Tegernsee. Perfect weather guaranteed an photo and video impressions. Have a lool at the event movie.